R 1988 2 hr. 11 min. 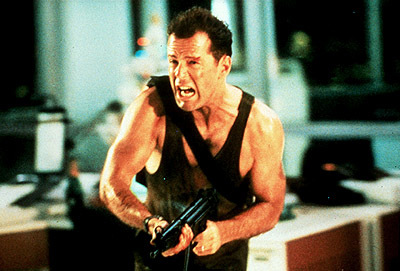 Bruce Willis plays NY cop John McClane, who is flying over to LA to see his beloved wife, Holly. Having been through some rough patches with her in the past, John soon hopes to patch things up by surprising her at her office Christmas party. And then what happens? BAM! BOOM! POW! They all end up as hostages to a bunch of terrorists. Well, everyone but John McClane, of course. And all the yuletide gets thrown out the fortieth story window. Now McClane is left alone to save himself and the 30 other hostages, as the ignorant FBI and his befriended but clueless limo driver ironically watch the disaster unfold. The only person he can depend on is a voice on the other end of his receiver, Sergeant Al Powell, who is the only officer outside of the building who truly knows the extent of the situation they’re in. This entry was posted in Movies/Shows and tagged action, Die Hard. Bookmark the permalink.